The RISK group was created in 2005 within the Faculty of Geosciences and Environment at the University of Lausanne (UNIL). We are now a member of the Institute of Earth Sciences (ISTE), which focuses on geology, geochemistry and geophysics. The RISK-group is led by one full professor, one lecturer and in 2015, it included 13 PhD students, 1 post-doc and 10 Master’s students. The research of the RISK group is oriented toward analysing and quantifying risks related to natural disasters caused by natural hazards, with a special focus on gravitational movements, erosion, sinkholes, floods, rainfall and hail storms, etc. It also includes research activities about vulnerability, resilience and risk representation and communications. Our research deals with field work (Fig. 1), laboratory tests, experiments, computer data processing and programming. 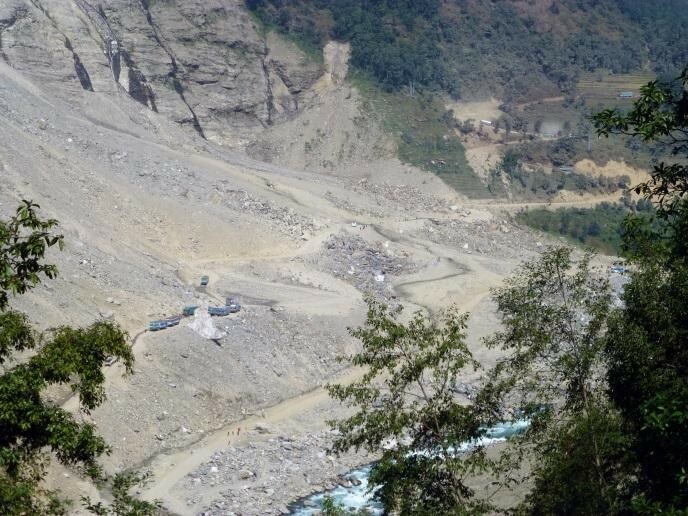 Figure 1 : Jure rock avalanche disaster occurred on 2nd August, 2014 (Sindhupalchok, Nepal). Deviation road crossing the deposit (picture Jaboyedoff 7.11.2014). In order to improve the predictability of disasters induced by landslides, we are developing innovative techniques for slope monitoring using laser scanning (LiDAR). It has been a strong focus of the group for several years: 3D point cloud processing, 3D fractures characterization and modelling, high-resolution ground surface monitoring, progressive failure analysis and coupling with other methods (i.e., radar interferometry, 3D seismic or photogrammetry, infrared imagery, etc.). This research is supported by newly developed algorithms and methods that are used for rock slope stability analysis, erosion budget quantification (including land degradation), debris-flow, landslide characterization and monitoring, as well as regional hazard assessment mapping. Research activities in the field are complemented by research in the lab on analogue modelling of slope instabilities and granular material behaviour. Computer modelling is also part of our activities. We aim at covering all the stages of disaster risk reduction (DRR), which involves going beyond hazard assessments to include the development of risk simulations, and web-based decision support systems for risk management, including cost-benefit analysis, involvement of population, etc. Improving risk perceptions and population preparedness is another line of research of the RISK group by proposing new approaches in vulnerability and resilience assessments of threatened populations (in Nepal and Bolivia). Our research is often performed in collaboration with other research groups around the world, as demonstrated by our participation in three European projects: Mountain Risks, SafeLand and Changes Our involvement in the scientific community is demonstrated by the creation of two series of conferences: the first, Slope tectonic will hold its fourth edition in Japan in 2017 and the second, Vertical Geology will certainly be organized by the University of Bergen in 2 years. The group is also greatly involved in the teaching of risks and related topics at UNIL, but several special courses or workshops are given abroad for the scientific community and professionals mainly about hazard assessments and 3D cloud point acquisition and interpretation. The group is now moving toward new techniques of hazard mapping using remote sensing. The first stage of our strategy ended a few years ago by proposing an integrated method for hazard mapping at regional scale for landslides, snow avalanches and floods (Jaboyedoff et al., 2012). This mapping corresponds to the first step of DRR, when almost no hazard assessments exist. To achieve that goal we developed tools such as Flow-R which simulates debris-flows, rock fall, etc. at the regional scale (debris-flows zoning with Flow-R: used by teams from ITC, Uni. Milano Bicocca, CNRS-Strasbourg, Uni. Vienna, Geological survey of Norway, ULAVAL, etc.). This also permits to assess rockfall risk along roads (Michoud et al., 2012). Risk assessment in mountainous areas (all over the world but more specifically in Alpine regions) is of primary importance for risk reduction especially because it facilitates improved land use planning and crisis management in areas that are more and more populated and where traffic on communication routes has been increasing. That is why we developed several projects about detailed rock slope hazard analysis and monitoring, which led us to propose models of a large rock slope instability that could generate a tsunami in a fjord (Aknes rockslide, Norway: Oppikofer et al., 2011), or reinterpret historical rock avalanche disasters (Frank Slide Canada: Pedrazzini et al., 2012; 2013; Argentinian case study: Penna et al., 2013). On a local scale, we made significant advances in assessing rock fall hazards with the computation of the failure mechanisms to locate the most susceptible rockfall sources (Matasci et al. in prep, Yosemite National park (USA) and Les Drus, Mont-Blanc (France); Matasci et al. accepted). We are monitoring landslide displacements using Lidar, InSAR, and coupling both in order to understand the mechanisms (Oppikofer et al., 2009; Michoud et al., 2014; Michoud et al., in review; in prep.) and to forecast failure. In addition, we are looking at precursory movements that may lead to landslide events (Royan et al., 2014; Abellán et al., 2009). The use of seismic noise permits to identify precursory signs prior to landslide failure (in collaboration with researchers from University of Grenoble: Mainsant et al., 2012). These observations have led us to co-organize The First International Workshop on Warning Criteria for Active Slides (part of activity of ICL/IPL; Cloutier et al., 2015), which are fundamental research needs for disaster risk reduction (DRR). We are studying erosion processes involved in coastal retreat (Michoud et al., in press) or debris-flow events (Theule et al., 2012). New techniques such as LiDAR permit to quantify the rate of changes that may be influenced by climate change (precipitation intensity and sea level changes), which can change risk assessment and risk reduction measures. In order to improve the understanding of landslides and their prediction (fundamental for DRR) computer models are used to calculate their stability (Brideau et al., 2011) and estimate their run-out distance (Longchamp et al. in prep.). Analogue models are also used to investigate slope stability and propagation and to test the monitoring methods developed (Longchamp et al., 2011; Carrea et al., 2012). Furthermore, in collaboration with Prof. Podladchikov (ISTE) we are developing a model to predict landslide-induced tsunamis flooding (Franz et al., 2013). Disaster simulation is also one of our objectives. When data are often sparse or lacking, knowledge must be replaced using stochastic approaches, as we did for the impact of shallow landslides in Switzerland, permitting to obtain exceedance curves of damage (Nicolet et al, 2013). Furthermore, in collaboration with insurance companies, such approaches have been applied to sinkholes and hail storms, the latter being on average one of the major cause of damage due to hazard events in Switzerland. DRR includes the above topics, but it also deals with two others aspects among others, which are human vulnerability and resilience, and risk communications. They are of great importance for populations. Surveys in Nepal illustrated that it is possible to reduce risk if the population is well informed (Sudmeier-Rieux et al., 2013). Based on that observation we are developing documents dedicated to local population capacity building for DRR. The new capabilities offered by computers and smartphones, led us to develop a risk decision system support (within the EU project Changes). This consists of a WebGIS platform that includes risk analysis and scenario evaluation, multi criteria analysis, etc. It also integrates several users’ level, including population (Aye et al., in review). In this section, we want to show how the apparently spread-out objectives described in the previous paragraphs actually participate in a global strategy of risk reduction (local) and DRR. Indeed, we consider that DRR cannot be conceived without an overview of the full process starting from the hazard all the way to preparedness and resilience. That is why our challenge is to keep research from the study of hazards to communications and protective actions. Figure 2 : Resilience of the world economy for the flooding of the industrial areas of Bangkok in 2011. This represents 10 bn US$. A) The price of hard disk Western Digital HD (from camelcamelcamel.com) (B) Ren (t) for which the shaded area represents the normalized loss 100% on year, data are taken from (A) (from Jaboyedoff et al., 2013). For our group, the first challenge is to improve the predictability of hazards in general and mainly for landslides. This applies as well to erosion processes, which are being modified due to climate change effects leading to land degradation, higher landslide frequency or more intense coastal retreat. It requires improving and refining the “mapping”, i.e. the detection and the hazard qualifications, and it needs to be supported by modelling improvements, in order to be more confident with predictions (hazardous areas definition). This means also that the number of parameters for numerical models must be as few as possible to reduce the number of sources of uncertainty. These goals will improve DRR by providing more accurate predictions. However, this cannot be achieved without improved monitoring systems based on new IT. Based on these developments, part of our research will focus on the detailed understanding of the development of landslides, which includes the study of rock failure and rheological changes in soil material. The expected results are the detection of critical locations and the prediction of failure. Depending on its location in the world, the quality of hazard qualification is very different due to local conditions. As a result, we want to provide tools based on sparse and incomplete data sets. This means that, in order to develop a well-designed DRR strategy, the hazard component of risk must be defined as early and accurately as possible, and DRR measures implemented accordingly. But these assessments must be based on adaptive management, or flexible approaches which allow integration of new knowledge. Consequently we will continue to work at developing simple and quick tools for hazard simulation on a regional scale, which will be used to perform risk analysis in order to detect the most at-risk situations. To manage such problems, we want to propose IT tools such as web or smartphone applications in order to involve local authorities and populations in decision-making about DRR. We are confident that at the end of the next decade such an approach will be possible all over the world. However, its efficiency will depend on well-designed communication strategies and management actions. In addition, the new capabilities linked to real time data acquisitions directly from inhabitants during disasters are a next step toward disaster management, but development must provide user-friendly tools otherwise such a project may fail. The advantage of such a flexible approach is that it can be applied to any countries, rich or poor. The unpredictability of future disasters due to human activity, population increase and climate change will create new situations that have never been experienced. As a result, more sophisticated disaster stochastic simulations must be developed by adding more physics in the model, and exploring more scenarios. We are also starting to work on risk assessments that integrate post disaster costs based on a new clarified resilience concept, which is used to define indirect costs (Fig. 2). This is very important because it can provide tools to support DRR in the improvement of non-structural measures. Beside such an approach, several major problems must be addressed, which are linked to the quantification of the uncertainty of models that are physical, conceptual, issued by experts, etc. and also coming from the data themselves. We are starting to develop Bayesian approaches to integrate expert’s knowledge in order to get probability in impact-probability matrix. The last point concerning our research contributions to DRR measures will be performed with the development of communications and supporting low-cost structural measures for DRR in poor countries such as Nepal. However our philosophy is that for populations already living with high risk “red zones”, they need to be well-informed of the risks and prepared to evacuate, rather than developing short-term structural measures that may give populations a false sense of security and temporarily reduce disaster risks, as we are witnessing in Switzerland. In addition to the previous section we want to add a few general statements about disaster research. First, DRR is mainly driven by the following questions: (1) what is the definition of zone at risk (hazard and vulnerabilities)? (2) What can be done for mitigation and prevention (defence or decrease vulnerabilities)? (3) Is it possible to design early warning and then prepare populations? (4) How to design preparedness for the post-disaster phase? Figure 3 : left debris flow induced Mitch hurricane (from Harp et al., 2002). 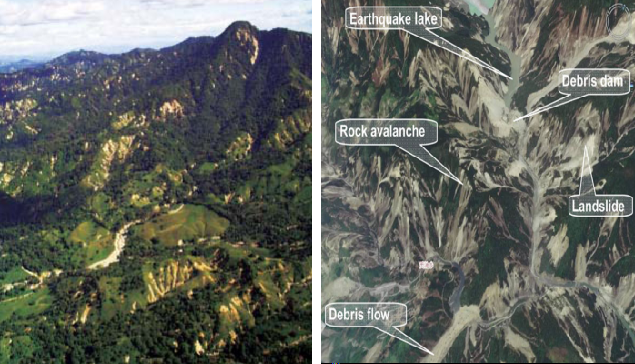 Right: Wenchuan post-earthquakes landslides (from CSBSM in Cui et al., 2011). The first major challenge is the funding of DRR research. If no disaster occurs for several years in some areas, politicians, as well as populations, forget the threats and then research appears as unnecessary. This shows the necessity to maintain continuous information about disaster research and potential threats without being alarmist. It is particularly true for landslides. Working mainly on landslide risks and disasters, we noticed that landslide impacts are often underestimated, because they are often an induced hazards after typhoons (like for Mitch; Harp et al., 2002) or earthquakes (El Salvador in 2001; Konagai et al, 2004; Wenchuan earthquake 2008; Yin et al., 2011) (Fig. 3). These observations support the need to develop more research to better understand the processes leading to natural erosion processes because their impacts are underestimated. In addition, the threats caused by erosion can be accelerated by climate change or by earthquakes as for the post Wenchuan 2008 earthquake (Huang and Fan, 2013; Zhang et al., 2014). In addition, we must remember that erosion can itself lead to a disaster like the former dustbowl in USA in the 30s (drought). Thus, erosion in general (including certain types of landslide susceptibility) must be studied taking into account the threats of climate change. Understanding such processes is fundamental for understanding all natural risks taking into consideration the growth and dynamics of world populations, including changes in human activities and infrastructure. Often risks result from inappropriate land use planning, thus an increasing in exposure and/or elements at risk rather than in hazard events. One of the major issues illustrated by recent hazard events is that single intense events such as storms, typhoons, earthquakes, etc. trigger indirect geohazards promoting secondary disasters which make the first disasters worse. his multi-risk situation is a true challenge for all natural hazards. The root causes of disasters has to be investigated, not only the hazard component of risk but also all the cascade effects that lead to damages, including indirect impacts involving infrastructure populations, authorities etc. We must keep in mind that most global data bases on statistics do not record “local disasters”, which can in total be significant. DRR managers or decision makers must address both large and small scale and equally damaging events. Addressing DRR requires research with clear objectives. Long term DRR research is linked to a fundamental understanding of processes that may not necessarily have applicable results such as earthquakes. But short term and mid-term research must be problem-solving oriented and must ensure that solutions can be applied for society and populations. Why is this important? Because often research is not oriented to solve problems for the society but only academic questions, even though it is funded with public money. But for a scientific community working on DRR, problem-oriented research is the basis of its credibility. The scientific community still has to work on predictability, monitoring, identifying major hazards and predicting them with the smaller possible uncertainty. This focus must improve understanding of natural processes and risk constructions. This necessitates to continue to develop investigations using the new capabilities developed for earth monitoring such as satellites (InSAR, multispectral, moisture, gravity, etc.) and ground variables such as seismic signals, geophysics investigations, infiltration, etc… The acquired data must be treated and modelled to verify their hypotheses using more and more powerful computers. But it must be supported by a strong ground truth verification or field work; too many teams are now giving up observation for pure modelling. The experimental approaches by analogue models are also one way to validate commuter model, as it is done for tsunamis. The previous points are fundamental because new words use are appearing in science that ignore reality such as “experiments” used for “computer simulations”. The need is to develop reliable predictive models based on observations (monitoring data) as input and also to develop models based on the fewest parameters as possible. An understanding of heterogeneities of the natural media involved in hazardous processes is necessary. This will lead to the development of local models valid for small volumes, not representing the whole of the phenomenon and then upscaled. Such approaches are possible with powerful computers. But we must keep in mind that models do not capture all the earth processes. For example, Meteofrance has shown that the meteorological models were not able to predict the intensity of the devastating winter storms that impacted northern Europe in December 1999 (Lothar, Martin, etc.). This demonstrates that expert knowledge is fundamental in DRR. Thus, as scientists are funded with public budgets, scientists also have a societal responsibility, and need to provide societal solutions. This debate is huge in the scientific community as underlined by the trial of L’Aquila in Italy (Hall, 2011), which is linked to communications and responsibilities about the 2005 Aquila earthquake. The debate is open and will not be closed soon. There should be a middle ground between some extreme positions taken by certain social scientists regarding the sentencing of the six scientist experts at the trial (Alexander, 2014) and their release at the second trial (Abbot and Nosengo, 2014). The question about responsibility and decision making in DRR has to be addressed in a proper way by the scientific community, especially when communicating to lay persons, otherwise the scientific community will face huge problems in the future. Consequently the uncertainty linked to the input of expert knowledge in “models” used to make decision must be addressed in future research. In addition, this quantification must be supported by the analysis of conflict of interest of experts with regards to decision making (ECDC, 2011). DRR implies decision making using risk assessments and addresses all the parameters controlling risk (vulnerability, hazards, elements at risk, exposure, etc.). The strict approach needs standardized data, but in most cases, it is not possible to achieve such a goal. The research must then also focus on how to evaluate risk to “get by as best one can”, to obtain reliable results. Also often the models to predict disaster are too sophisticated, and input data are lacking to use them properly. It is often better to use simpler models. For example, regional models can be used to calculate risk, but are not suitable for evaluating scenarios. Disaster scenarios require local modelling (= event modelling). One solution will be to use flexible stochastic simulations that can be performed using various sources of data. They can be web-based, and facilitate public participation in DRR. Public participation and the empowerment of certain populations in the decision making process is a major research challenge in future. As human activities are increasing globally, we are now forced to live in at-risk regions, which means that we are not necessarily able to protect people with physical measures. They have to be replaced by crisis management with the participation of local authorities and populations. This problem can be underlined by the prediction of Laska (2004) for the disaster of Katrina, because of the lack of preparedness. Beyond that risk communications is also a challenge, even if many initiatives are starting to be successful. Reducing risks by decreasing hazard, vulnerability, element at risk or exposure, is a standard approach, but there is also a need to clarify indirect cost estimation of disasters. In our opinion, this can be linked to a new definition of resilience using the instantaneous resilience concept. If risk R represents the direct costs, CRE is the indirect costs induced by a disaster and then the total impact of the disaster (It) can be written as: It = R + CRE. Resilience is included in CRE. In conclusion, DRR research needs to address all the steps starting from hazard quantification through the involvement of all stakeholders, which represents a challenge because all the methods have to be adaptive and flexible. This can be achieved only if the above statements are respected and transparently addressed. The difficulty is to convince politicians and local authorities to design simple and efficient strategies and actions for risk reduction, because the world economy does not provide sufficient means to create the “perfect” DRR.